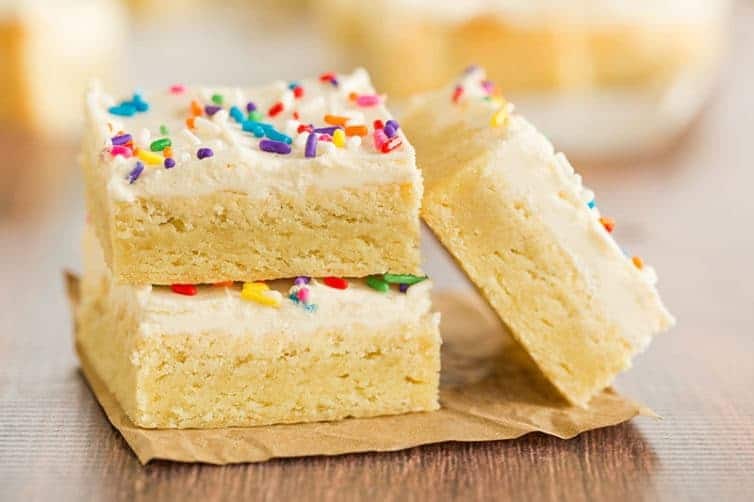 These easy sugar cookie bars are super soft thanks to cream cheese in the dough, and are topped with the best vanilla buttercream frosting. When I was little, one of my very favorite holiday traditions was making cut-out sugar cookies with my mom. She would mix up the dough and then my sister and I would help roll it out and cut out all of the different shapes. I still remember all of those metal cookie cutters just like it was yesterday! Once they were baked and cooled, we got to decorate them with icing, sprinkles, and sparkling sugar. I would save the ones I was most proud of for Santa on Christmas Eve, naturally. As I got older, my love of sugar cookies never faded. I went to college here in Pittsburgh and lived on campus, and while my dad got sick and passed away during the second semester of my freshman year, I have such fond memories of that fall semester. On a handful of occasions, he would stop by on his way home from work and we would grab dinner at one of the eateries on campus. Knowing how much I loved sugar cookies, my mom would usually send him with a package of my favorite sugar cookies from the bakery in the grocery store. I always equate sugar cookies with those visits, and I wish it’s a tradition we could have continued the entire time I was at school. Fast forward almost (gulp) twenty years, and I still love sugar cookies, but unless it’s the holidays, I don’t need to bust out the cookie cutters. 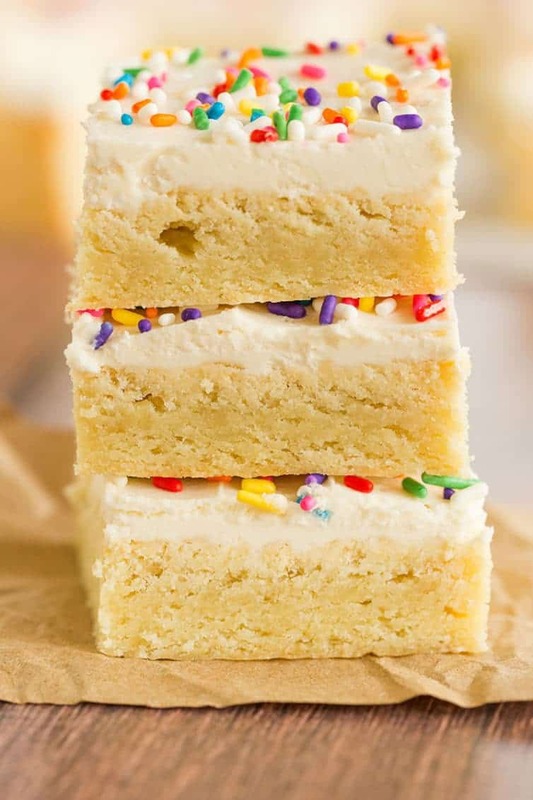 For a super quick and easy sugar cookie fix, I make these sugar cookie bars and slather them with my all-time favorite vanilla buttercream frosting. They are insanely soft and really quite perfect. Let’s chat about this dough because it’s quite possibly the BEST sugar cookie dough I’ve ever made, and I’ve made countless sugar cookie recipes. Most of the recipes I’ve made have used just straight-up butter, with the exception of the recipe for copycat Lofthouse sugar cookies, which uses sour cream in the dough. 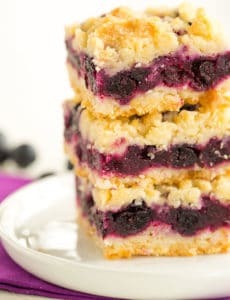 Those are wonderful soft cookies, but the texture is most definitely different than what was achieved with these cookie bars. I’d say they are more soft cake-like, versus the fluffy texture in these bars. I’ve recently seen quite a number of sugar cookie recipes using cream cheese in the dough, and after using it in some soft batch chocolate chip cookies that I loved, I decided to give it a try here. I wasn’t at all surprised to find that it works beautifully in sugar cookie dough – the flavor remains pretty neutral, but the resulting cookie bars are so super soft and almost fluffy, but not at all cake-like. Basically, they’re sugar cookie perfection. A lot of sugar cookies use almond extract in addition to vanilla extract to flavor the cookies; I do not include it here, so you might be wondering if you should add it or not. I say it’s a total personal preference. For as much as I love actual almonds, I literally cannot stand (and might actually LOATHE) the flavor of almond extract. I do not enjoy a single thing that bears the flavor. Totally bizarre, right?! 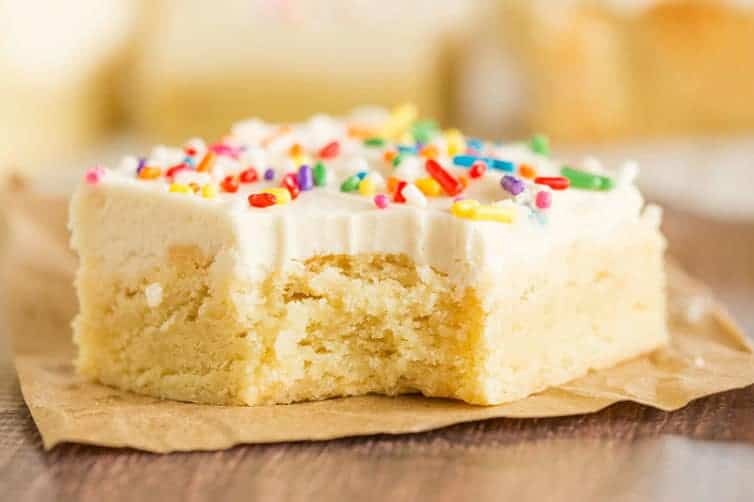 Needless to say, these sugar cookie bars are made without almond extract, but if you feel like your sugar cookies absolutely need it, go ahead and add a little bit. Can You Use This Recipe for Cut-Out Cookies? I can’t give you my 100% guarantee because I haven’t done enough testing on it yet. I’m sure it would be just fine if you simply used a round cutter, but if you have a detailed cookie cutter, I’m not sure what the spread factor is just yet. I’m planning to fine tune a perfect cut-out sugar cookie recipe before the holidays, so stay tuned! 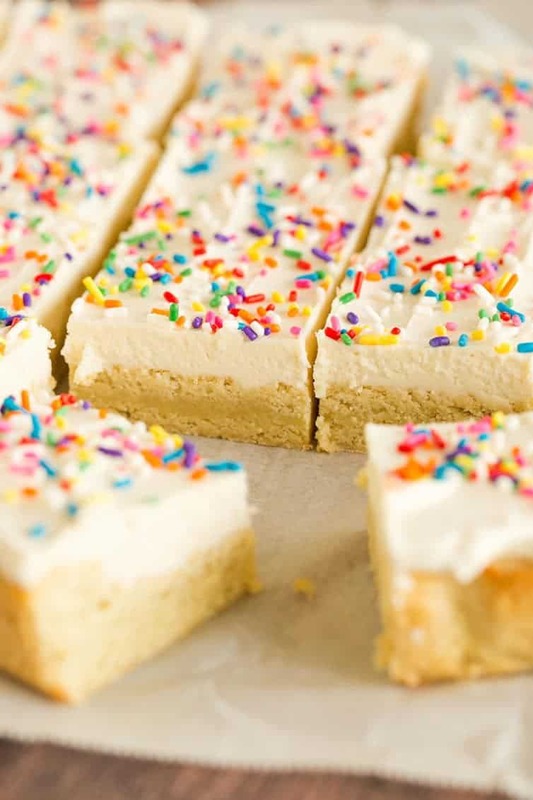 Have I totally convinced you to whip up these sugar cookie bars ASAP? I certainly had a lot to say about them, ha! Feel free to substitute your favorite frosting, and even give it a tint of color for holidays, graduations, gender reveals, etc. 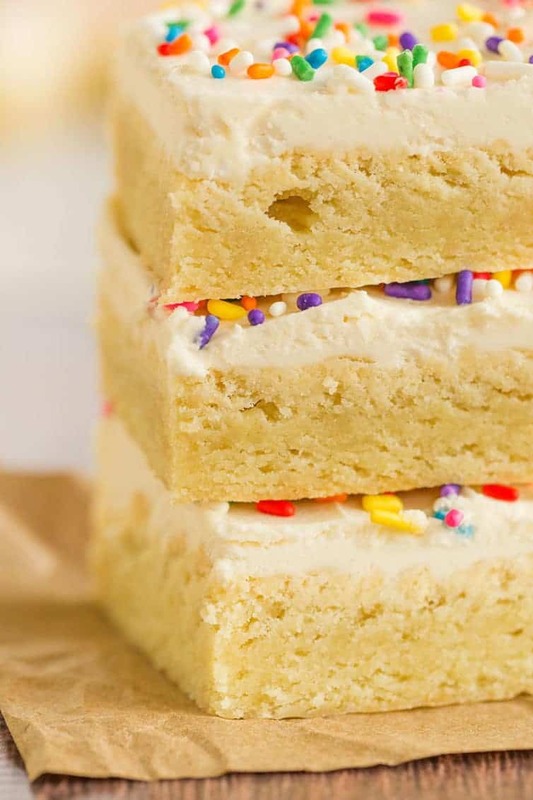 If you’re a sugar cookie fanatic like me, you’re going to absolutely adore these bars! 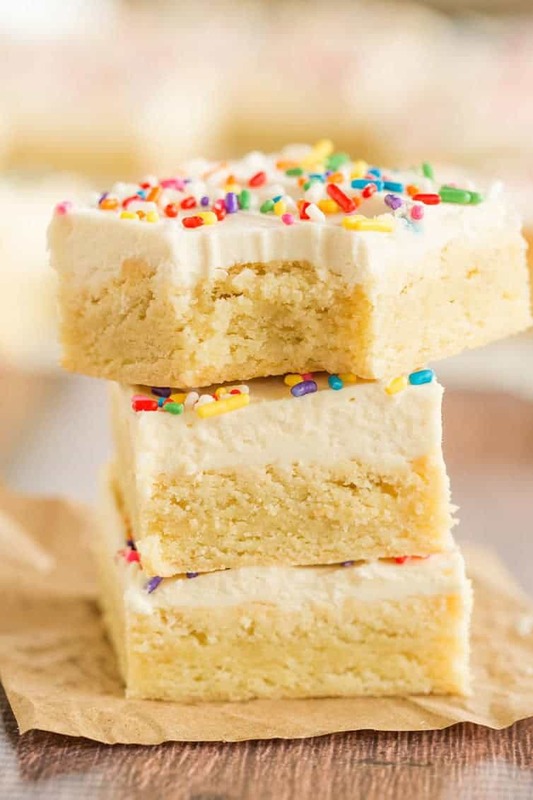 Super easy sugar cookie dough baked into bars and topped with the best vanilla buttercream frosting. Make the Cookie Bars: Preheat oven to 350 degrees F. Grease a 9x13-inch baking pan or line with parchment paper; set aside. In a medium bowl, whisk together the flour, baking powder, baking soda, and salt; set aside. Using an electric mixer, cream together the butter and cream cheese on medium speed until smooth, about 1 minute. Add the sugar and continue to beat until light and fluffy, about 3 minutes. Add the egg and vanilla extract and beat to combine, about 1 minute. Reduce the mixer speed to low and gradually add the flour mixture, mixing only until barely combined. Use a rubber spatula to finish mixing, ensuring there are no pockets of flour remaining. Using a spatula, spread the dough into an even layer in the prepared pan (the dough will be thick!). Bake until light golden brown and a toothpick inserted in the center comes out clean, 20 to 25 minutes. Place the pan on a wire rack to cool completely before frosting. Make the Vanilla Frosting: Using the wire whisk attachment of your stand mixer, whip the butter on medium-high speed for 5 minutes, stopping to scrape the bowl once or twice. Reduce the speed to low and gradually add the powdered sugar. Once all of the powdered sugar is incorporated, increase the speed to medium-high and add the vanilla, mixing until incorporated. Whip at medium-high speed until light and fluffy, about 2 minutes, scraping the bowl as needed. Spread the frosting over the cookie bars and decorate with sprinkles, if desired. Cut the bars into squares and serve. The cookie bars should be kept in an airtight container at room temperature for up to 3 days (you can store them in the refrigerator for up to 1 week). I made this recipe exactly as outlined. It was moist and delicious. I would say, however, that it is VERY sweet, especially with the frosting. Honestly, these would be just as good without the frosting, or with half the frosting. I made these cookies and did use half almond extract and half vanilla. So so good! I really like the flavor of almond extract and these cookies were a big hit. So simple and soooo delicious. The buttercream frosting is perfect. Made these yesterday for a friends birthday and they are yummy, thank you! Only thing I did different was added a few drops of almond extract to the frosting as I do like that flavor, but went heavy on the vanilla :) Thank you! Can you use a jelly roll pan? Hi Trace, Yes, but they will be thinner and you’ll need to reduce the baking time a bit. Enjoy! These are wonderful. I made them for a party this summer and they were gone before I got to the party! I have found that if they are a bit underdone they are just as delicious as when fully cooked! I can’t get enough of the icing!! Made with white whole wheat flour and 4tsp orange juice, was a hit! Love these! My kids love sugar cookies, sprinkles and frosting (I mean what kid doesn’t? 😄) I’ve never added cream cheese to sugar cookies, it sounds delicious! I’m going to have to make these for my kids, though I’ll probably add the almond extract cause I love it! Oh so gooood…someone suggested chocolate ones…do you think that’s something doable??? Totally doable and adding it to my list right now! So I baked these cookies and brought them to our family BBQ….what a hit!! 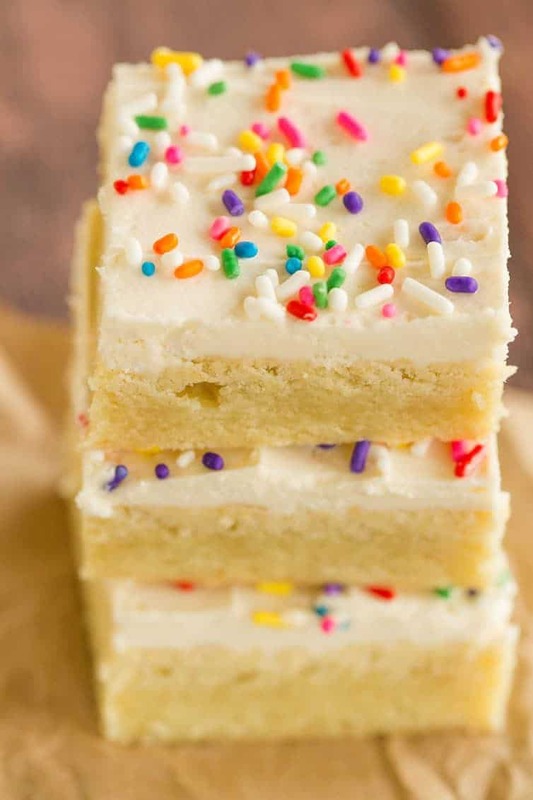 Even my sister in law loved them and she’s a chocolate lover as well as a cheesecake fanatic but she had one of these frosted sugar cookie bars and just loved them. I was surprised when my husband told me he will never go back to those “Lofthouse” cookies. And my husband isn’t a big dessert eater. These cookies are a definite keeper!! Thanks for sharing them! Thoughts on making the bars and freezing…then frosting before serving? Hi Carolyn, I think that would work just fine! What if you frosted and then froze? Would that be bad? Would you use a glass or metal baking pan for these bars? Hi Lauren, Either one would work! 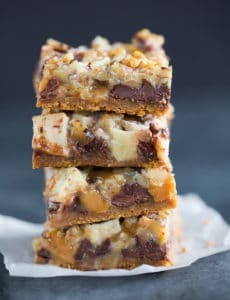 I made this cookie bars recently and they were a big hit! Great flavor. I’ll definitely hang onto this recipe. Instead of 2 tsp of vanilla in the cookie dough, I used 1 tsp vanilla and 1 tsp almond extract. And I kept the vanilla in the frosting as written. It was the perfect amount of almond flavor. I’m the opposite. I strongly dislike almonds, but LOVE almond paste and extract. I made these today for my family’s weekend splurge…oh! How yummy! 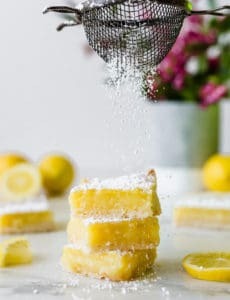 I had to use about twice as much powdered sugar, but they are so good and really easy to make! Yum, need to make these. Definitely on my things to make for the kids list! That was such a sweet story. Thanks for sharing it. I am sorry your tradition could not have continued longer. This recipe looks great. Not a sugar fan but think I might like these. Don’t like the almond extract either. I do love almond extract. I like different extracts in general. If I make Tortuga cake I always use rum exctract. I like sophistication in taste, not just plain super sweet and sugary taste. Different strokes for different folks. Me too! And the smell! Oh it’s heavenly! These bars are gorgeous and I love the looks of them! Thanks for linking to my Softbatch Cream Cheese Chocolate Chip Cookies and I am glad to hear that cream cheese did the trick in these bars! They look to be soft and fluffy sugar cookie perfection! I love sugar cookies! I have been shown and tried to make cut out sugar cookies for a very long time, and at 39, they’re still a no go. Mine NEVER turn out like the shape they’re cut in. My best friend is a cookie queen at Christmas. and even she couldn’t help me. LOL I like the idea of a bar form that can be made easily and enjoyed. YUM! Right there with ya, sister! I have been trying for years! Thank you – I can’t stand the taste of almond extract either and I hate to get something thinking it’s going to be vanilla only to find it’s been ruined with almond. and adjusting the bake time a smidge. YOU ARE NOT ALONE!!! I hate almond extract, too. Anything that remotely tastes like almond extract is immediately a no-go for me. Disaronno, amaretti cookies, marzipan… all of that–blech. But real almonds? I’ll eat those by the pound. These look so good! I think I need to add them to my baking to-do list!! I have the very same opinion about almond extract! I tried a recipe that called for it a few years ago and hated it because that extract is very distinct and very overpowering. Needless to say, I have stayed away from it since then . These bars look tasty and thank you for leaving out the almond extract! When my sister got married last year, she used a very expensive baker to make her cake. They used almond extract. I thought the cake was horrible but got it down and tried to be as complimentary and positive as possible. But a second piece? Couldn’t do it! ANd I wonder if anise wouldn’t be a nice extract to use with the vanilla?